Although Borneo is actually the third-largest island in the world, many travelers aren't completely sure where it is. At least for now, that's potentially a good thing. The tourist hustle and hassle are low while the rewards remain great. Borneo is pretty well situated in the geographical center of Southeast Asia, just east of Singapore and southwest of the Philippines. The island is roughly centered just north of the Indonesian archipelago. Three countries have territory in Borneo; by the size of the claim, they are Indonesia, Malaysia, and Brunei. Is Borneo Part of Malaysia or Indonesia? The short answer: both! Indonesia claims a lion's share — around 73 percent — of Borneo in a province called Kalimantan. In fact, Kalimantan is so large (over 210,000 square miles) that Indonesians refer to the entire island simply as "Kalimantan" rather than "Borneo." Indonesian Kalimantan occupies most of the southern part of Borneo. The northern edge of the island, which is also the most visited and developed, is part of Malaysia. Brunei is squeezed between the two states in Malaysian Borneo. Malaysian Borneo, also called East Malaysia, is made up of two states: Sarawak and Sabah. Malaysian Borneo is world renowned as a place to enjoy rainforests and wildlife, with a nice mix of accessibility and wild, remote regions. Indigenous, yet-to-be-contacted tribes that once practiced headhunting are still thought to exist in the jungles! Ideally, you'll have time to visit both Sarawak and Sabah on a trip to Borneo. Flights between the two are affordable. But if you're forced to choose, make a decision based on the goals of your trip. Sabah, the northern state in Malaysian Borneo, is home to more people than Sarawak, It generally gets more attention from tourists. Kota Kinabalu is a good-sized capital city, home to around half a million people and a good number of shopping malls. Sabah boasts Mount Kinabalu — a popular trekking peak (13,435 feet / 4,095 meters) for travelers in Southeast Asia — as well as world-class scuba diving in Sipidan. Sarawak gets a little less attention from tourists, but that keeps prices lower and people friendlier than ever. 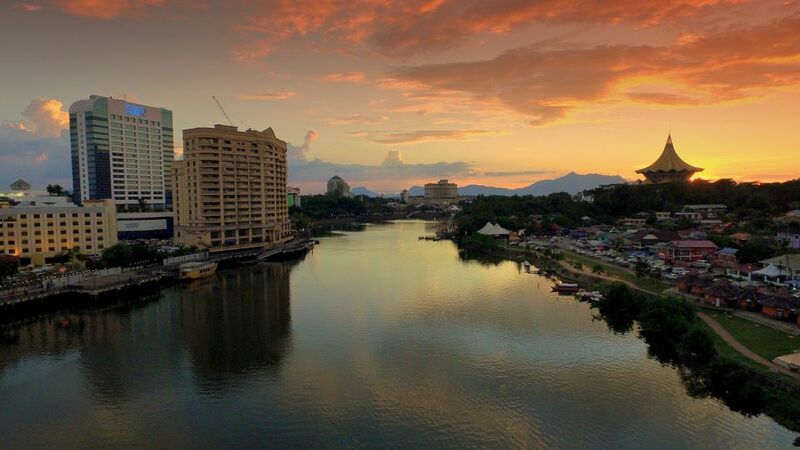 Kuching, the capital, is among the cleanest cities in Asia. A pleasant waterfront leads to great seafood. With a little timing, you can hit one of the most exciting cultural music festivals in Southeast Asia: the Rainforest World Music Festival. Interestingly, Sarawak is home to the world's most expensive edible fish: the empurau. A single, prepared fish can cost more than US $400 in a restaurant! The federal territory of Labuan is also part of East Malaysia. Duty-free Labuan Island (population: 97,000) and the smaller accompanying islands are an offshore financial center collectively referred to as "Labuan." Despite mostly undeveloped beaches and plenty of World War II history, the island lures relatively few tourists. Tiny Brunei — an oil-rich, independent country — separates Sarawak and Sabah in Malaysian Borneo. With a population of just over 417,000 people, Brunei is famous for being the most observant Islamic country in Southeast Asia. Citizens in Brunei don't pay a lot of tax and enjoy a higher quality of life than their neighbors. Even life expectancy is higher. The government is largely funded by oil and natural gas, which make up for 90 percent of the GDP. Much of Shell oil comes from offshore drilling in Brunei. Despite plenty of natural beauty, tourism has yet to really take off in Brunei. Officials cite a strong Brunei dollar as one of the potential put-offs. Visiting Borneo is easy: Plenty of budget airlines operate flights from other places in Southeast Asia to the big ports of entry in Malaysian Borneo. Flights from Kuala Lumpur can be surprisingly cheap. Traveling overland through Malaysian Borneo from Sabah to Sarawak takes time and patience. Choose your port of entry based on your highlights for the trip (e.g., orangutans, trekking, scuba diving, etc). Arguably one of the wildest places on earth, Borneo is unfortunately also one of the most rapidly deforested places on the planet. Logging has whittled down once-pristine rainforests to make way for sprawling palm oil plantations. Palm oil is used around the world in a wide range of products from chocolate and snacks to cosmetics and soaps. Sodium lauryl sulfate (listed under a staggering number of different names) is a very popular palm-oil derivative that is used in nearly all soaps, shampoos, toothpaste, and many other household products. The substance isn't just used for cosmetics and toiletries. Lots of processed snacks and foods contain palm oil. Much of the palm oil used to create sodium lauryl sulfate and the many derivatives come from Borneo. Unless specifically labeled as sustainable, a large amount of palm oil comes from unsustainable plantations in Malaysia and Indonesia. Although available, many large companies have yet to commit to sustainable palm oil. Colgate-Palmolive — owner of the popular natural brand Tom's of Maine — is one of the worst offenders. Borneo is one of two places on the planet where endangered orangutans can still be found; Sumatra in Indonesia is the other. Orangutans are among the most intelligent primates on the planet, however, they are being threatened by habitat loss due to palm oil plantations. Orangutans giggle, fashion tools (including umbrellas), exchange gifts, and have been taught to play computer games!